Just before turning in we had set the anchor alarm app and went to bed…..only to be woken by the screeching of the alarm going off at 0130. The wind had got up and was now NW – even thought it was supposed to be SW- W – which would have been ok for the anchorage. We had dragged slightly with the change of wind direction. We tried to reset it but couldn’t and I am not sure we would have slept any way. So we decided to set off early as it was better to get some sleep in watch system and be safe. So we headed off to Harstena. Thankfully I had put in 2 routes into the chart plotter the previous day – one shorter route picking our way through rocks and the other much simpler but longer back out through the channel. Given the fact it was dark and we were tired I picked the easier one. With night only lasting for a very short time at this time of year – the sky was lightening as we left one Archipelago and set sails for the next one and by the time we got to it the wind was blowing a steady 26 knots – so as we picked our way through the rocks. Once sheltered by the islands, the sea became like a mill pond – which didn’t reflect the strength of wind. It is quite incredible that you can have 45m depth of water yet 2 boat lengths away you can see rocks. 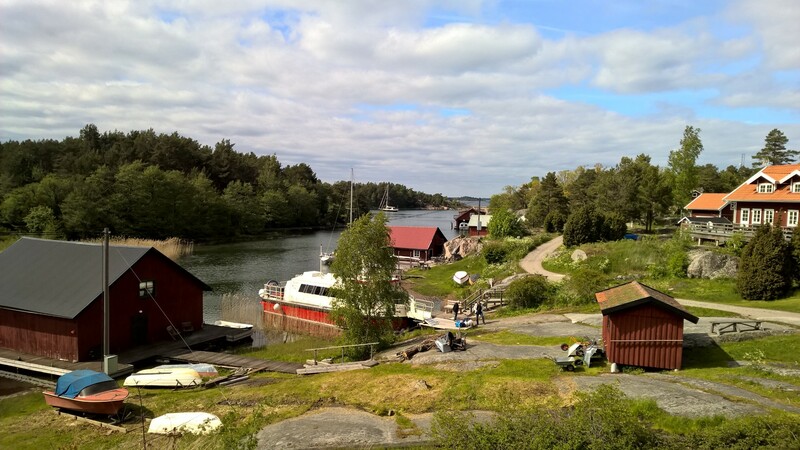 Harstena had a perfect little anchorage which was concealed as was the village, until you had entered the cove. 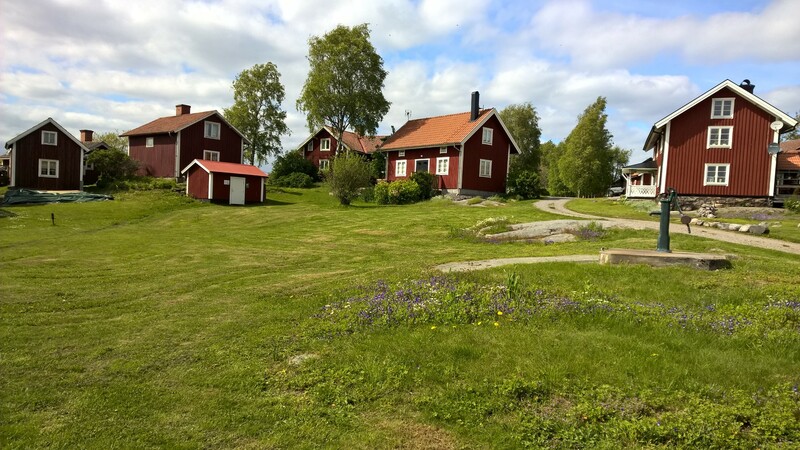 One side of the shore was lined with old red wooden houses. We picked our spot, and the anchor dug in first time, and as we were surrounded by reeds on one side it reassured me that there was some mud for the hook to dig into. After lunch we pumped up the dinghy – so much more civilized now that we have a 12v dinghy pump. We fitted the torqueedo (electric outboard engine) – but it failed to start, we assumed that the battery wasn’t charged but it was later diagnosed that Mags had forgotten to switch it on! So we rowed the short distance ashore. The hamlet has about 45 permanent residents and in the summer makes its living from the tourists that visit – but thankfully this was off season so it was just us and the locals. It is a beautiful, authentic village full of little red houses in various states of repair and the village dates back to the 14th Century. With it being out of season the bakery wasn’t open yet or the shop – so after a short exploration we headed back to the boat and an early night after a very long day. Which anchor app was it?